Fig. 3. Histochemical analysis of gene promoter activities in of the three Arabidopsis thaliana GID1 genes during seed germination. 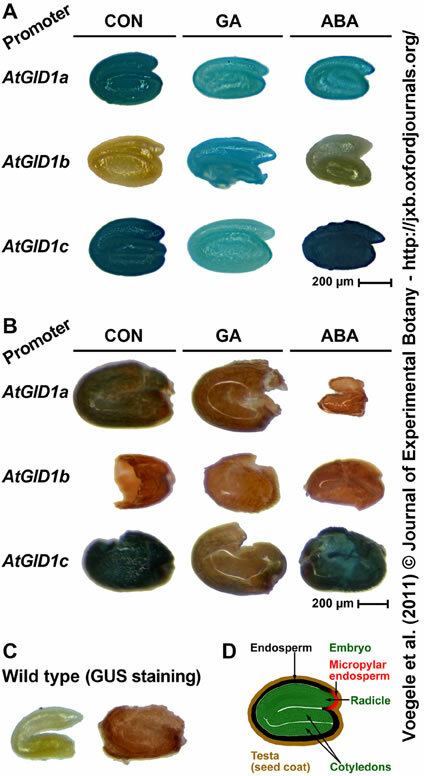 Seeds of GUS reporter lines in which the three GID1 gene promoters, AtGID1a, AtGID1b, and AtGID1c control the transgene transcription were imbibed in medium without (CON) or with 10 µM GA4+7 (GA) or 5 µM ABA added. After seed dissection into embryo and 'coat' (testa plus endosperm) at 20 h, histochemical GUS analysis was performed. A, Histochemical GUS analysis of isolated embryos from GID1 reporter gene seeds. B, Histochemical GUS analysis of isolated 'coats' from GID1 reporter gene seeds. C, Negative control for the histochemical GUS staining with isolated wild-type embryo and 'coat'. D, Cross-section of A. thaliana seed indicating the specific seed tissues analysed used in the experiment.